Out of curiousity, I kept track of how many picks I wove in a 40 minute session. 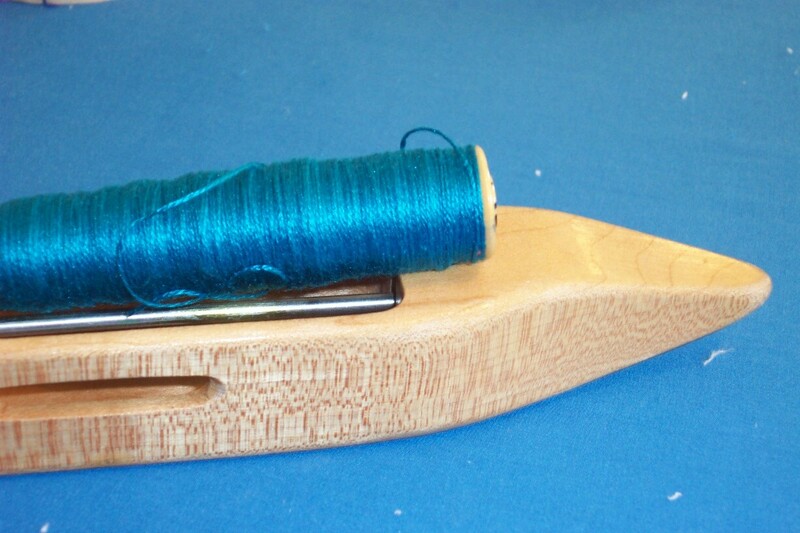 This number includes changing bobbins, trimming weft tails, taking sips of water etc. 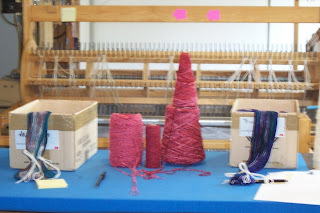 It is not the speed of my weaving rhythm, which is, obviously, faster. In 40 minutes I wove 1280 picks or about 32 picks per minute. Weaving was a bit slower than usual because I'm weaving with fairly fine weft and I have not yet perfected how to wind the bobbins so that they wind off smoothly as they get near to empty. I rather suspect that as I figure out the bobbin winding my speed will not have to slow to accommodate bobbins that don't behave nicely. At any rate I am delighted with the way this cloth is turning out. 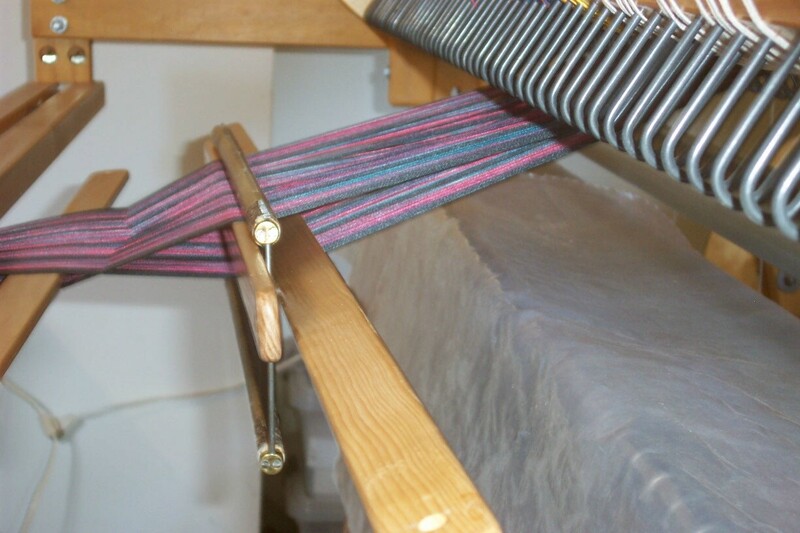 The warp is 2/16 cotton with 2/16 cottolin weft. I'm just weaving this as yardage which I will cut to towel lengths once off the loom. 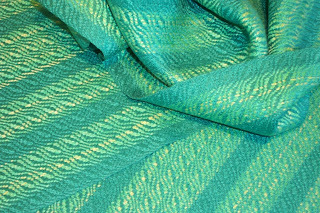 I have enough for around 5 yards (or about 5 towels) in this colour and then I'll switch to a slightly darker blue/grey which I think will also look very nice. I may - or may not - change the tie up and treadling. I think this one is looking pretty good. Finished threading the warp this morning, got it sleyed, tied on and started weaving. 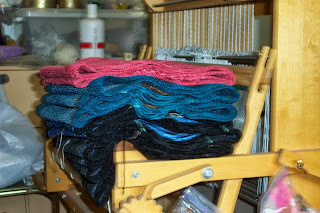 The dark blue is the header - just any old 'waste' yarn I have - dribs and drabs left on bobbins. This time I paid attention to my notes and threaded it the way the last towel warp was supposed to be done. Once again I will just weave yardage with the pale mint green and then cut that up into suitable towel lengths. When I switch to the cottolin - left overs from my summer tops - I will change the tie up and do something different, perhaps in actual towel lengths, perhaps just yardage again. The goal is to try and use up some of the odds and ends of yarn in my stash. We are in final count down for the show season. My suitcase is on the lr floor waiting to be filled - I just have to remember the things that need to be packed, like my silk jacket for the conference fashion show. I leave in just 8 days so there is some time to weave. Last night I managed to put a small dent in the hemming pile, but there are more mats to come so I'm going to have to stay on top of my production and deadlines. Doug is at the annex painting the booth shelves. Once that's done I think we will be as ready as we can be in terms of booth display - then it will be time to start packing up the inventory so that it will be ready to be loaded into the van. I'm thinking we need to cut back at least one show next year. We'll see how the smaller shows go - if they are worth doing or not. With less than 12 days until I leave for the Eastern Great Lakes conference, followed closely (every following weekend until the end of November) by retail sales, I realized I need to dial back my production and take some time to rest. I have been pushing, not hard but steadily, since the end of May and I'm tired. I am also becoming more and more aware that I am no longer in my 30's (much as my inner spirit insists) but in my 60's. It takes longer for me to recover from big pushes and the next 8 weeks are going to be one gigantic road trip. One trip is tiring, the schedule I have coming up is going to be....exhausting. So my plan (because you know I always have one!) 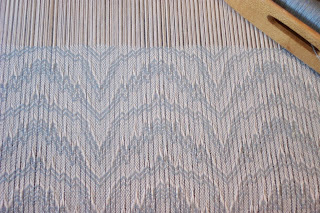 is to finish the mat warp currently in the loom, weave the peach mat warp I wound yesterday, then switch to the AVL and see how much of that 20 yards I can get woven before I leave on the 8th of October. In between there are administrivia tasks that need doing - bring my ledger up to date, remitting my GST forms, getting a massage (absolutely necessary! ), a phone call re: another possible webinar next year - and those are just the things I can think of off the top of my head. I'm sure others will reveal themselves as the days go by. During the trips I will have my iPad so I can work on notes for the possible Next Big Project because after moaning about no teaching dates for next year, a number have come in and now my schedule is full enough that I am not going to be able to take much time off in order to do prep work for those workshops, guild programs, webinars. I know that I could actually weave more than what I've outlined, but it isn't just the weaving there is all the finishing to do, too. Last night during a meeting I attended I did manage to hem 6 place mats. But there are 5 times that number still to do, plus the mats I've woven since Doug pressed the ones ready for hemming. There are still 4 dozen painted warp scarves that have to be wet finished, trimmed, tagged and priced. There are a dozen rayon chenille scarves, ditto. Additional inventory for the Langley guild sale to ready and deliver during one of the road trips, then be picked back up again once their sale is over. Today a friend came and helped me sneak up on 'tidy'. 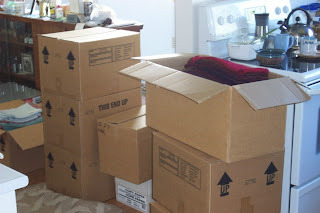 Quite frankly, even though she knows me, knows the chaos I live in and the length and breadth of my stash, even she was somewhat staggered at just exactly how much yarn was living in all those boxes and bins. In four hours, she only managed to deal with two types of yarn - the 2/8 cotton and the 2/16 cotton. And make a token stab at the shelves with a mixture of bamboo and linen and miscellaneous stuff. But those two yarns are the ones I use most often and being able to see them - and therefore find them? Priceless! 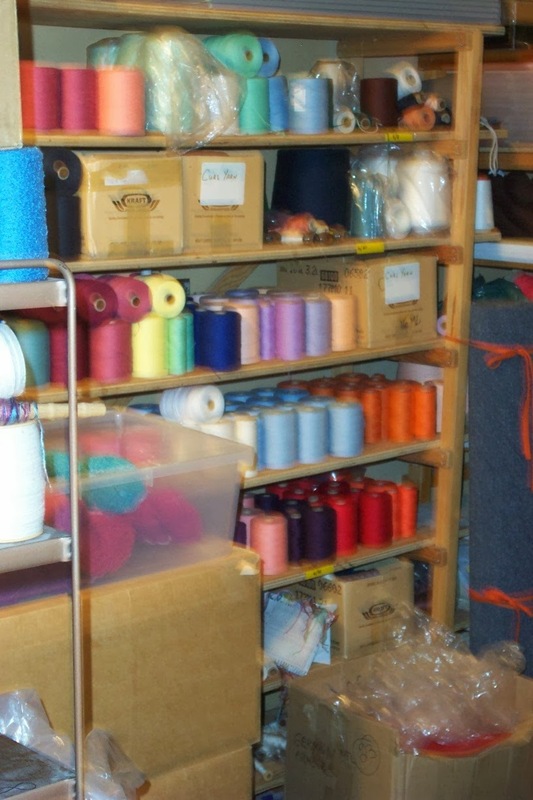 I hesitate to point out the number of boxes of wool, rayon/bamboo and rayon chenille I have yet to deal with, but please - let me live in the fantasy of a well organized (nearly) studio for a day or two? This is all to say that the uncertainty of my future was reaching extremely uncomfortable levels - not knowing if I should even attempt to book teaching events, if I would have to suddenly cancel all my commitments. So one of the burning questions - indeed, the burning question I had for the oncologist today was - when can I expect to need to set aside 6-8 months of my life again to concentrate on treatment? He was very honest and said that conservatively I can expect an 18 month remission from the last Rituximab (the end of May, 2013), that once it comes back - because it is indolent (i.e. slow growing) - that treatment would likely begin 2 to 3 years once 'relapse' has occurred. So, conservatively, I can expect to have the next 4 years fairly 'free' from worry in terms of booking teaching events. This is a huge load off my mind. I make a fairly large percentage of my income from teaching and not knowing what to expect was leaving me feeling like I ought not book anything. Knowing something of what lies ahead, I feel confident that I can make those bookings and follow through on them. But that isn't all. I returned home from my appointment at the clinic to an email confirming a date for the Next Big Project. It is far enough away that I can make it through the current show season, do my teaching commitments in the months ahead and still have time to do all the preparations that need to be done in order to be ready. With the pressure of deadlines ramping up, I'm multi-tasking. I would wish for a clone except she'd probably start doing even more stuff. 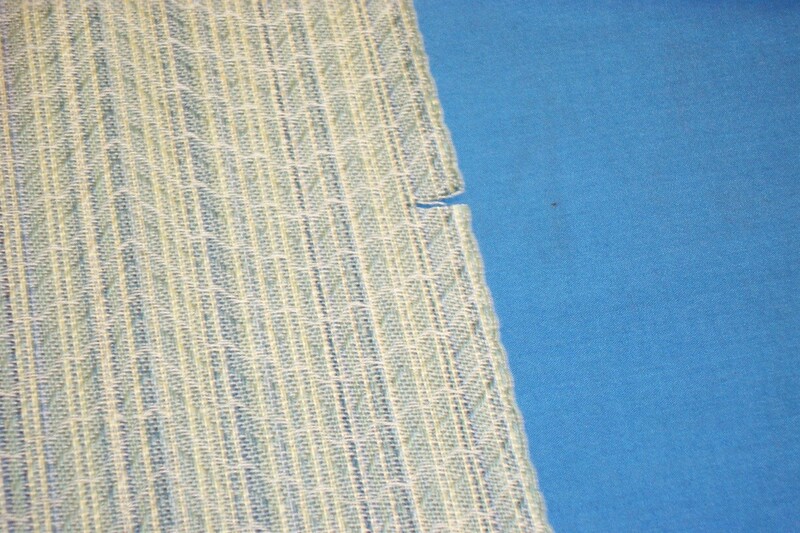 Just finished cutting the place mat warp off the loom and started cutting them apart to serge. Doug will go pressing later this week so I'm trying to get stuff ready to be wet finished. The warp is beamed on the AVL so I need to thread that. I'm going to use the same threading as the last warp but this time I'm going to do it properly (she says, optimistically). 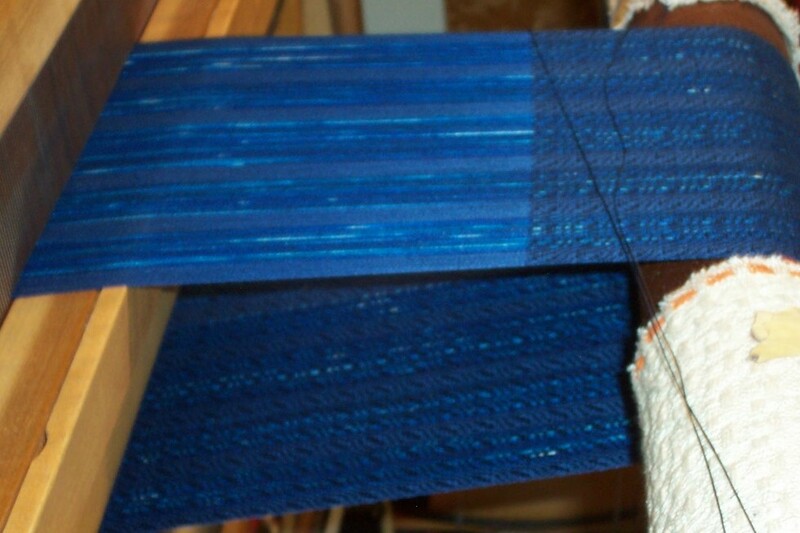 Another warp is being wound on the warping board also for place mats. Again, trying to use up some of my never-ending stash. And I started thinking about the title 'master' weaver. It's not one I wear comfortably, partly because the perception is that if you have mastered something, everything you produce is 'perfect'. The fact is that I am far from perfect. Where the 'mastery' of a craft comes in, in my opinion, is in the knowledge of one's materials - their limitations and how to push them - coax, might be a better word - to perform beyond those limitations. Mastery is also in knowing how your equipment and tools work and their limitations. And how to push/coax them to perform beyond those limitations. Mastery is knowing when less-than-perfect is good enough - and when it isn't. Mastery is being confident that whatever happens, you can figure out what to do about it - which might, at times, mean tossing the whole project into the recycle bin. Mastery is having a full tool box full of tips and tricks, knowing when to employ them - and being willing to acquire more. While I do feel that I have mastered certain aspects of my craft, I certainly do not know everything there is to know about weaving. I look forward to continuing to learn, even if that means learning how little I know. It is what excites me about weaving every day - learning something new, something that I did not know before. In the meantime the Deadline Dragon continues to huff down the back of my neck....time to get back to the studio. Therefore, when I am in full blown getting-ready-for-sale-season, I am not pursuing my love of weaving by wandering down unexplored avenues. I am trying very hard to get as much product ready for the sales as I possibly can. 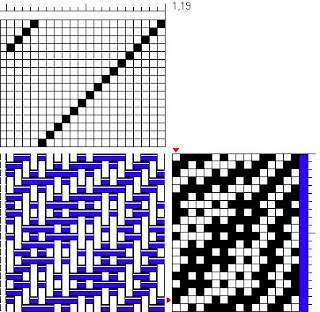 I have no time to baby recalcitrant warp threads, use more labour intensive techniques, slide around on the slippery slope of the learning curve, etc. 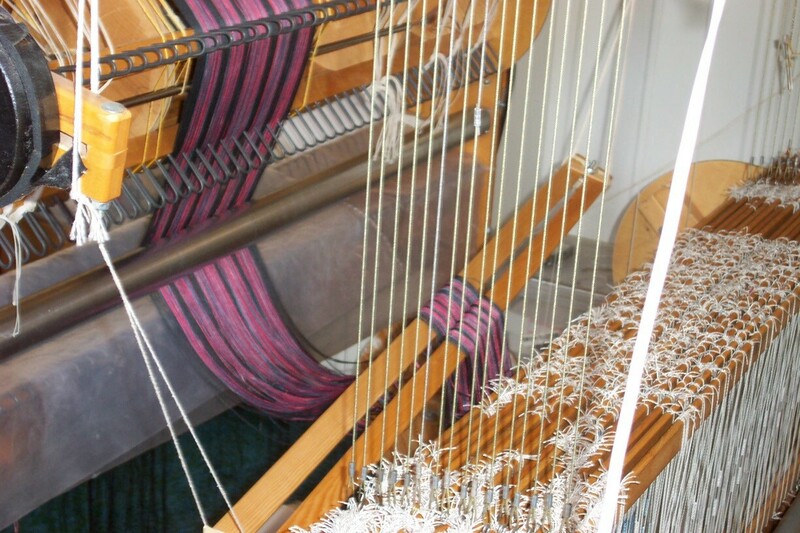 I need to slam warps into and get them out of the loom as cloth just as efficiently as I can. With just two weeks before I leave for the Eastern Great Lakes conference, I am feeling the pressure of deadlines enormously. I have very little patience. I am...testy. I have made a significant financial outlay for the up coming sale season. I have put very many of my 'eggs' into one basket - that of a 4 week time frame during which I need to earn enough money to last me all through most of next year. It's not a very secure feeling. After the rather disastrous day yesterday where I cut not one but two rayon chenille warps off the loom and consigned them to the recycle bin, I decided I would only weave two more rc warps (hopefully with no adventures during them) and then turn my attention back to place mats. The disadvantage with having all my inventory elsewhere is that I can't just run around the corner and see how my inventory is looking. Mind you with everything jammed onto the shelves it was hard to see exactly what I had, anyway! But I do remember that I also need more place mats. If I can get 4 more scarves woven (two are now done), that will give me about a dozen and a half of those, not a large selection, but at least enough to be starting the season with. The advantage to switching to place mats is that they are very fast to weave, I can bring bins of them with me to Seattle to hem - I can even bring unhemmed ones to Vancouver/Calgary along with my small flat bed press and during down time find a quiet corner and hem. Then press them in the hotel room to add to inventory as needed. Once the show season is over I can go back to the rayon chenille and weave them in a more leisurely fashion. I have used enough of the yarn to see that the shelves do have a tiny bit more space on them, but I'm still far from done with rayon chenille. As for the AVL? Doug is winding a 'fast' towel warp onto it. They won't be terribly fancy, but once again I will be able to use up some of my never-ending (seemingly!) stash and have some tea towels for sale and hostess gifts. Not sure when I'll find time to weave on it, but at least it won't be nekkid. Weaving with rayon chenille, you are pretty much confined to plain weave unless you work hard to stabilize the yarn in some fashion. Since it is plain weave, my approach to designing a line of rayon chenille scarves is to make short warps (two scarves only), lots of stripes, lots of saturated colours. So why, you might ask, is there only one pink scarf on the top of that pile? I was cutting my 'losses', that's why. 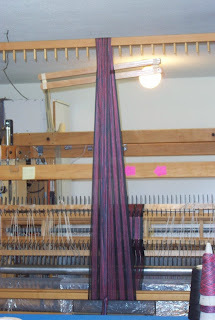 I had just finished weaving the first scarf when a warp end broke. 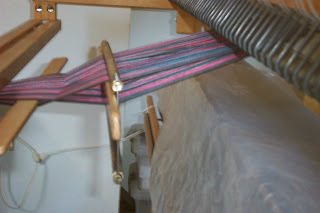 No worries - I added in a repair thread intending to 'fix' it Kerstin's way by weaving the old end alongside the repair end when the original warp end was long enough. So I wove about 12 inches, threaded the broken end into the same heddle as the repair end, pinned it in place and commenced weaving. Whereupon another end broke. ??? Sigh. 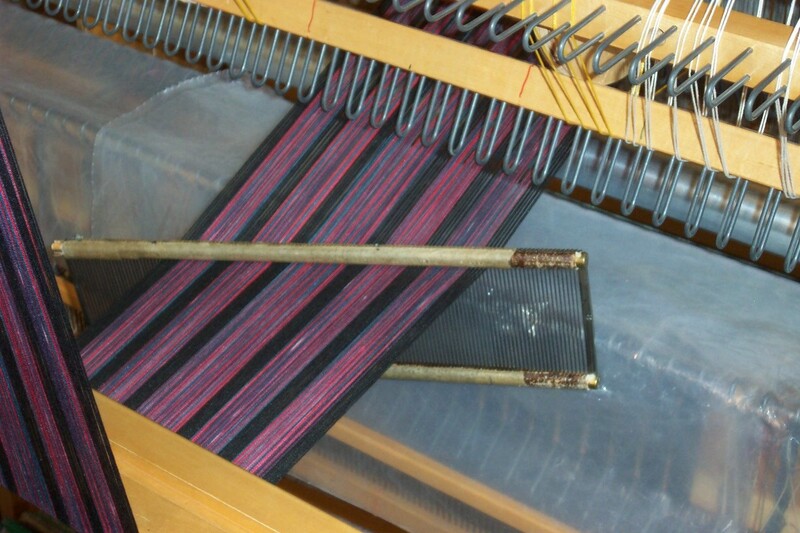 Add in another repair end, fiddle around weaving the broken end in at the same time as the repair end and.....a third warp end broke. At this point my patience, never very thick on the ground, evaporated and the scissors came out. I cut off the warp, cut the finished scarf away from the rest of the warp and tossed the balance into the recycle bin. Yes, I just threw a few dollars of yarn away. No, I don't feel the least bit guilty. My time is much more valuable and I could see that if the broken ends continued, I'd be investing a lot more of my labour into that one scarf than I could hope to get back by selling it, all the while knowing it was riddled with broken/repaired ends. Time to move on to the next in hopes that it would be more co-operative. MIMO, after all and it was getting to the point where I was putting maximum effort into it and getting nothing but aggravation for my pains. Look forward. Move on. With four weeks to the first show of the season, you might think there is plenty of time to do everything that needs doing. You'd be wrong. Four weeks is hardly any time at all, especially considering that I will be gone for one of those weeks. With such a busy show schedule, it is imperative that I have everything ready in good time because once I leave for New York and the Eastern Great Lakes conference it is going to be a flat out race until mid-November. One of my life long goals has always been to be more organized. Creative chaos is fine, but not very helpful when you start losing track of things, can't find them, spend hours looking for them. So we are totally re-arranging the storage room here and at the annex. To that end a friend came today, tagged/priced and helped pack all of the show inventory up to transfer it to the annex. Now Doug has to sort and organize everything over there. Next week I'm hoping the same friend will come and help sort through some of the boxes and bins of yarn and get them organized onto the now empty shelves. Next year I will be continuing with my efforts to stash bust because one way to be more organized is to have less stuff. The best way to have less stash is to weave it up. With the possibility of another Big Project happening in May, the Deadline Dragon will continue to huff and puff down the back of my neck giving me the goal of having a tidy studio in case the May Big Project actually happens. And if it doesn't, I'll still have made significant strides towards my goal of a cleaner, tidier, more organized space. The help of a friend to get there? Priceless. Having exercised a successful attitude adjustment, I am now well underway in terms of rayon chenille scarf production. 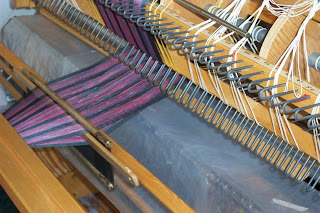 The first warp went into the loom yesterday with one scarf (out of two) already woven off. This morning I decided to start sorting through the yarn inventory to see what I could possibly come up with for colour combinations. Here is the beginning - two warps wound, one more on the way. Since the photo was taken, I wound two more warps (the pink/red in cones/tubes in the picture and a black/blue/grey). On another front, someone asked me about the small (four shaft) 'Swedish' Snowflake draft which was published in Weavers and Best of Weavers: Twill Thrills. I will send it in a Word document so you don't need to have weaving software. When I was a child I could hardly wait to grow up, be an adult, be....free. The problem is, there is just exactly as much freedom when you are an adult as when you are a child. You still have obligations, responsibilities...stuff you'd rather not do but must. Being all grown up means that you finally understand that life isn't fair and it isn't free. If you want something you have to work for it, one way or another. Being an adult means that you must engage your own sense of responsibility, not rely on a parent or boss to remind you of what needs doing and when it needs to be done by. You are in charge of your schedule, your long range goals, your success at meeting your deadlines. So this week I'm going to practice being an adult. In spite of the fact I am tired of making scarves, I still need some at a lower price range than what I have been making. 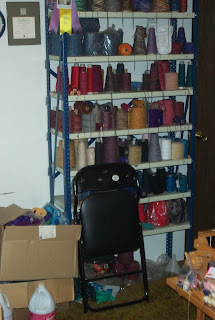 In spite of the fact I really don't much want to work with rayon chenille, I have a full shelving unit full of the stuff. In fact, the two boxes beside the shelf are also full of rayon chenille. 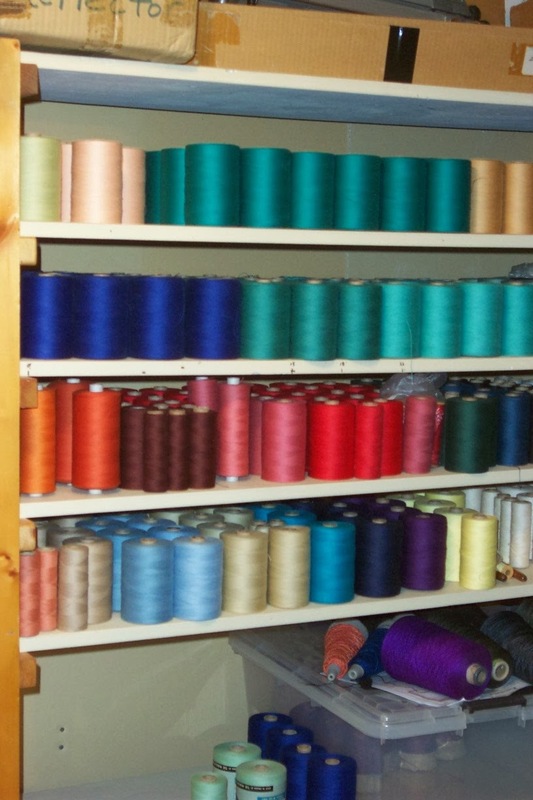 In spite of the fact I don't have the range of colours I would like to have to work with, I am going to use the limitation of colours as a design inspiration and do the very best I can with what I have on hand and use up some of this yarn! Neither of these photos are quite the right colour. The top one is about as dark but too grey. The bottom is the right blue but not dark enough. But the best I can do with my camera and software. The point is that I could have titled this post Making Lemonade, or Design Feature or even How the Light Gets In. But all of those titles would have reflected a negative attitude toward this warp and I would rather focus on the fact that these scarves look quite nice. I'm thinking that they might be very suitable for a man - or woman - but women (generally) tend to choose the brighter colours, men generally darker value ones. See, when I dyed the blue skeins, I neglected to remove the factory ties and they acted as a resist so that when the ties were removed there were white 'specks' left in the yarn. 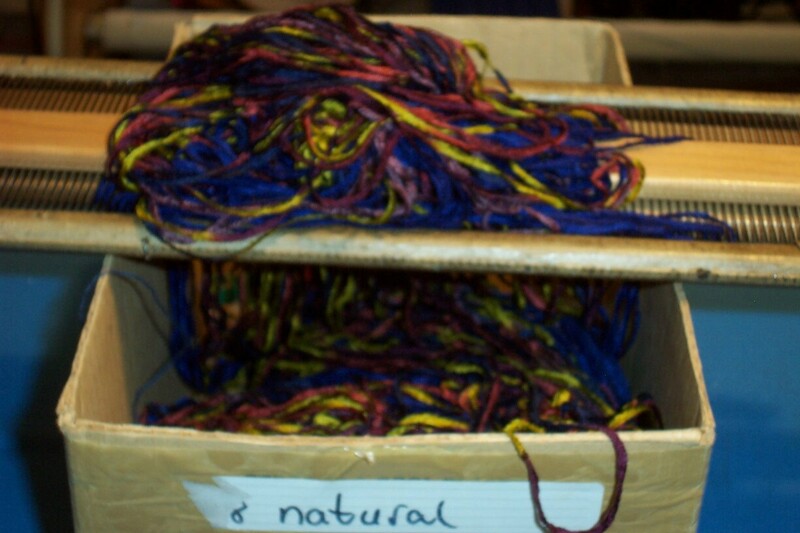 Too embarrassed to show the world my deficiencies as a dyer I stuck them in a bag at the back of the studio and when Doug said he would cone the silk skeins off, I tossed the 'defective' skeins in as well. Because there was really nothing wrong with the yarn. They just weren't 'perfect'. In the end, they are weaving up into a lovely set of scarves that rather remind me of stars shining on a dark night. When something you make doesn't turn out, I suggest putting it away for a few months and then look at it again. Instead of seeing the way it doesn't resemble what you'd set out to do, you may find that you quite like what you made, just for it's own self. Just like the disappointing dye job looks just fine in this warp. Currently reading How the Light Gets In by Louise Penny. If you are a fan, Still Life (her first Gamache novel) has been turned into a movie and will air for the first time tomorrow, Sept. 15 on CBC. Autumn really is here - the show season begins in just 6 weeks and today I got the promotional material for Art Market in Calgary, AB. I have 4 complementary tickets to give away. If you are in - or will be in - Calgary November 14-17 and would like the tickets, email me at laura at laurafry dot com First come, first served. Otherwise you can go to The Art Market website and get a $2 off coupon as above. Life has been....distracting and I've not managed as much weaving as I would like to have done. But I am making some headway on the silk scarves. In addition we have purchased new flooring for the booth (the carpet we were using was just too, too ratty!) and a new mirror as well. With the new corner location in both Vancouver and Calgary I wanted to spruce up the look of the booth. Lack of attention while winding this bobbin means that a 'loop' of yarn 'fell off' the end of the bobbin leaving slack which will eventually drag off the end of the bobbin and wrap around the spindle of the shuttle during weaving. Unless I deal with it immediately. 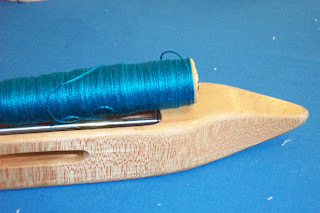 The easiest way to do this is to put the bobbin into the shuttle and pull the weft off from the side, then when it sluffs off and wraps around the spindle it's a fairly simple matter to unwrap the loop from the spindle (or axle) and carefully continue winding the weft off. It is also noticeably, albeit slowly, turning from summer to autumn. The first indication - and a subtle one - is that the humidity is dropping. Our warm humid summer days are slowly ebbing away. 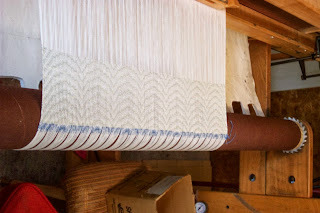 Which is unfortunate as the silk is becoming more and more prone to static electricity making winding the warp and then beaming it more and more of a challenge. I am going to hurry through these thankfully fairly short (at 7 meters) warps as quickly as I can and then switch to something a little more co-operative. Like cotton. You know how you meet someone for the very first time and you just know you'll be good friends? That's what happened when I first met Lynn. She liked my puns, my silly jokes, didn't mind being teased. When ever we managed to get together we laughed and talked and laughed some more. That laughter has been stilled. She is no longer in pain. Rest in peace, Lynn. I will miss you. So many of my friends are not here in person, but through the avenue of the internet I can stay in touch with them, some on a daily basis. But nothing beats getting together in person, exchanging smiles, hugs, laughter. Consider yourself hugged today, even if it is just a cyber hug. You are all precious to me. 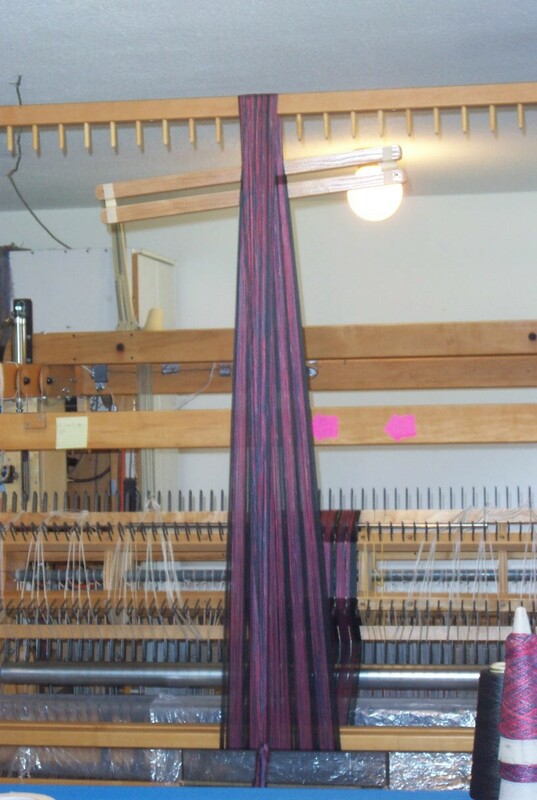 For one warp of two scarves, I was able to weave it off without mistakes, although it meant un-weaving a number of times as I lost track of where I was in the 20 pick repeat and had to go back to find my place again. 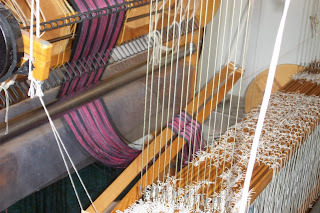 This level of concentration didn't appeal to me over the course of a number of warps, many of them longer than the two scarf warp I did initially. 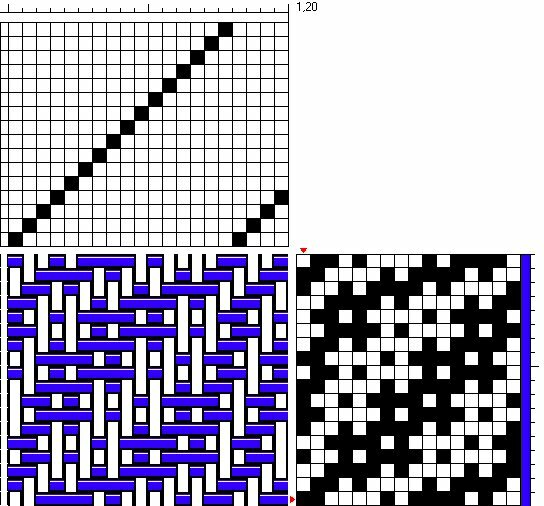 In order to make the whole process easier, I decided for a number of reasons to put the warps onto the AVL. It took about an hour to transpose the tie up to a 16 shaft lift plan - of course I made a number of mistakes! What I did was assign a number to the first 16 ends in the 4 shaft version, then checking the tie up on the four shaft version, indicated on the lift plan all the ends that were to behave as though they were on shaft #1 went up when they were supposed to. Ditto shaft 2, 3, and 4. 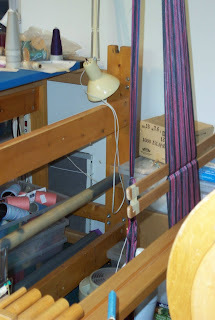 In order to do this properly, I set the drawdown for an ordinary treadle tie up, which revealed one more tie up error! Once everything was cleaned up and the shafts shuffled where I wanted them, I reset the the draft to show the liftplan. I got the first scarf woven this afternoon and started the next one. 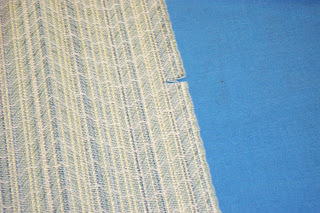 I'm hem stitching on the loom so that when they come off they only need to be wet finished and trimmed. 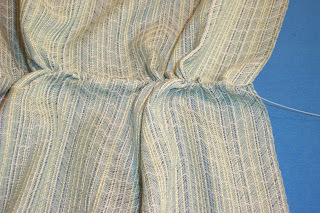 Hem stitching is actually faster than fringe twisting, and because the warp is silk, it can be left loose. It might get a little fuzzy, but it won't start to disintegrate like the regenerated cellulose fibres. I could have done the whole run of scarves on the smaller loom, but it is much faster to weave on the AVL with the auto-cloth advance. I don't have to stop every two inches to advance the warp. It is also 'easier' on my neck, not having to keep re-setting the tension. Since the loom was behaving (mostly), it took just about an hour to weave the first scarf. And I can continue putting place mat warps onto the small loom. Or maybe, just maybe - deal with that rayon chenille! Sometimes people comment that they would love to use a valet but they don't have any room for one. Not having any room is partly why I use one. 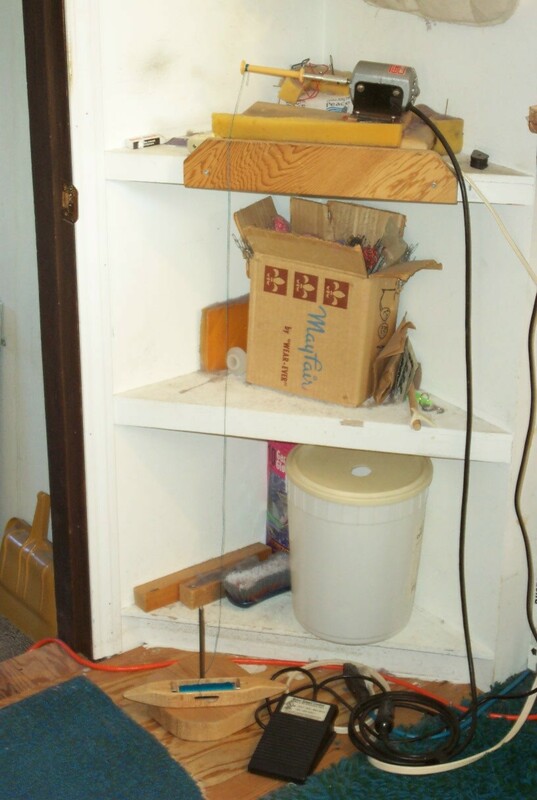 In the first photo you can see how closely to the back of the AVL my work table is. 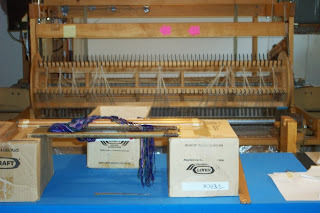 It is so close that in order to beam the AVL sectionally, I have to roll the work table farther away from the loom. Using the warping valet mounted in the ceiling I don't have to move the table - just have to be careful when I bend down! 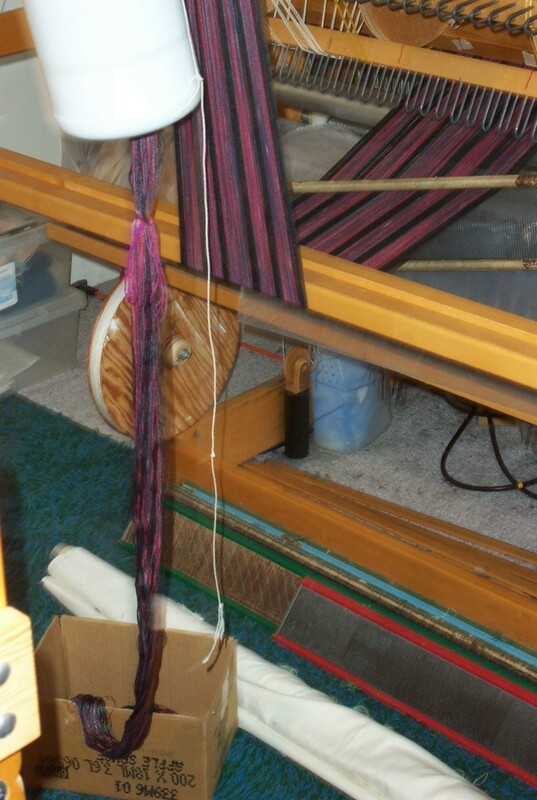 Here I'm using the reed swiveled in order to keep the warp going into the proper sections. This photo shows a little more of the set up - reed between beam and sectional rail, the warp running from the bottom of the beam, under the rail, up over the warping valet and the water jug I use for weight. The chain is in one of my little boxes. And a more distant shot so you can see it better. The lease sticks have been brought up to the valet as far as possible and will move downwards as the warp rolls onto the beam. Then the lease sticks will be moved as high as possible. Repeat. into which I insert one of my longer lease sticks. Then the short lease stick nearest the reed is removed and the 2nd lease stick tipped upright. I move the long lease stick as far away from the reed as possible (you can see it 'hiding' behind the beam sectional rakes) in order to create a second shed into which the second long lease stick is inserted. The lease sticks are then clamped together and hung from the loom's castle between the beam and the shafts. Dressing the AVL this way is a bit more fiddly than dressing the small loom, so why do I do it? 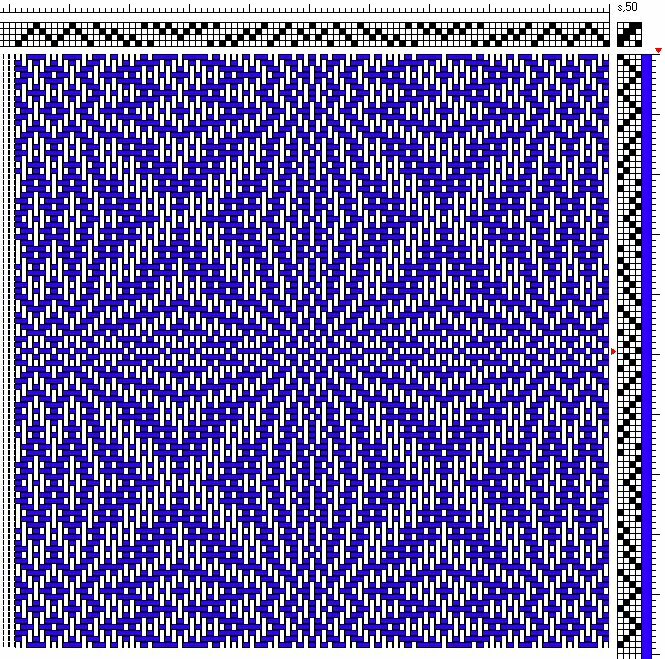 I'm doing it because the rest of the process using the AVL is going to be a lot faster/easier than using the small loom. A little 'extra' time spent at one stage of the process in order to save lots of time further along is never a waste of time! I'm all about Minimum Input, Maximum Output. 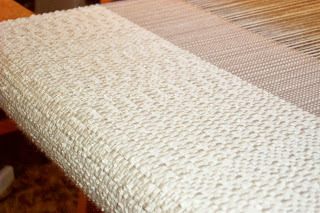 For this towel warp, I was using up a limited quantity of yarn for weft. 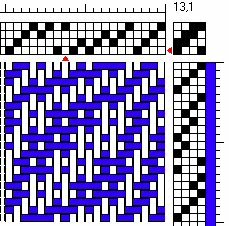 Since I didn't know how far it would go, rather than design a towel with specific hems and/or border design, I decided to just weave yardage and cut it up to towel length when I was done weaving. With no obvious cut line, here is what I do. I measure out the length I want for the towel (including allowance for hems). And then I serge and voila, ready for wet finishing (after I've fixed a few loops in the weft). 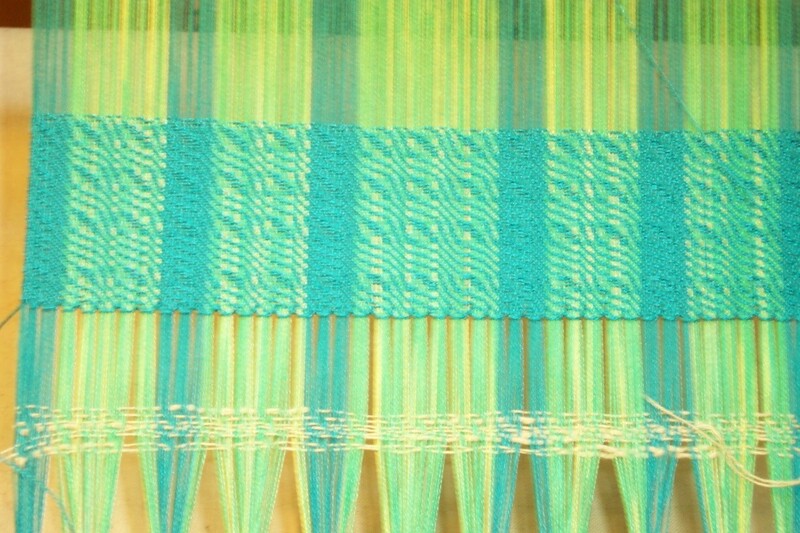 Just checked the Weaving Today website and the webinar is now available for recorded 'viewing' here. I will be giving this topic as a mini-workshop (3 hours) with some hand's on examination of various yarns at the Rochester, NY guild in October. If you want to attend, I have contact info - I heard they were still accepting registrations. I am also doing this topic as the guild program for my local guild next week. something that lies outside the main body or group that it is a part of, as a cow far from the rest of the herd, or a distant island belonging to a cluster of islands: The mail, along with eagerly awaited “special orders,” was delivered to the outliers weekly, thanks to Cap'n George and his trusty steamboat. someone who stands apart from others of his or her group, as by differing actions, beliefs, religious practices, etc. : an outlier among Muslims; an outlier among conservatives. Synonyms: outsider, nonconformist, maverick; original, eccentric, bohemian; dissident, dissenter, iconoclast, heretic. an observation that is well outside of the expected range of values in a study or experiment, and which is often discarded from the data set: Experience with a variety of data-reduction problems has led to several strategies for dealing with outliers in data sets. a person whose abilities, achievements, etc., lie outside the range of statistical probability. Geology . a part of a formation left detached through the removal of surrounding parts by erosion.Compare inlier. Obsolete . a person residing outside the place of his or her business, duty, etc. Recently someone referred to me as an 'outlier'. I was pretty sure I knew what she meant, but I finally looked up the definition. 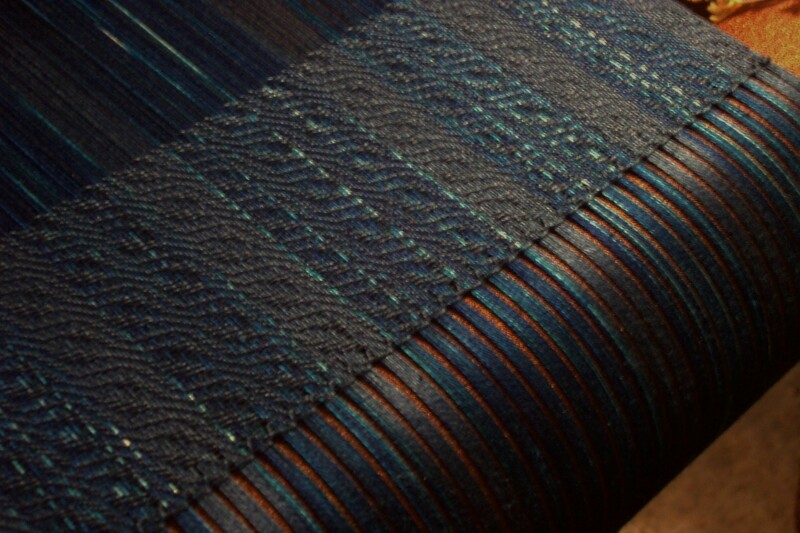 I've called myself a weaving heretic for a while now, but I think I like outlier better. Heretic sounds so....rebellious.... although it is listed as a synonym... when I don't really want to cut myself off from the rest of the weaving community. I just don't do things the way 'most' weavers may do them. 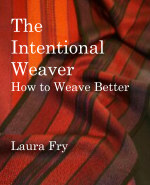 Right from the get go, choosing weaving as a profession when the vast majority of today's weavers choose it as a hobby. Finding satisfaction in weaving regardless of whether or not it's plain weave, solid black, 100 yards of it. 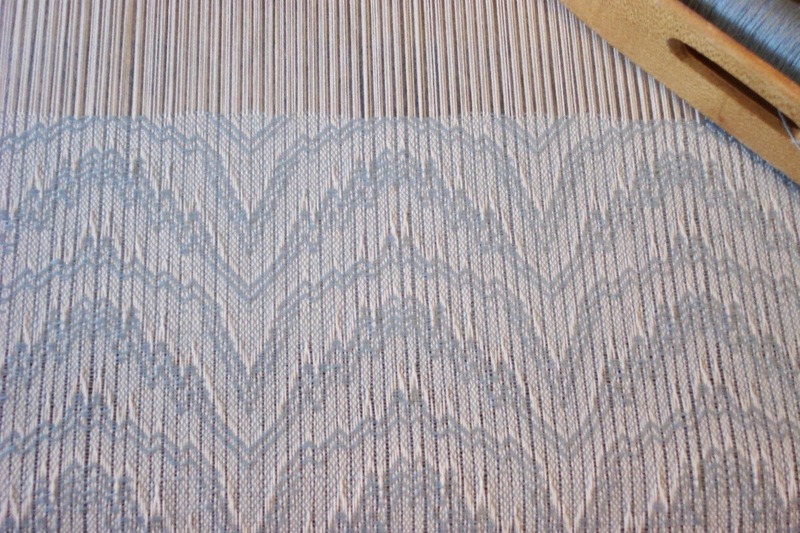 Preferring to delve deeply into the craft when it seems that most weavers prefer to follow someone else's directions. Nothing wrong with that - but I want to be the one who writes the directions, not follow someone else's. Focusing on efficiency and ergonomics so that I can continue to weave, hopefully without repetitive stress injuries, for a long time to come. 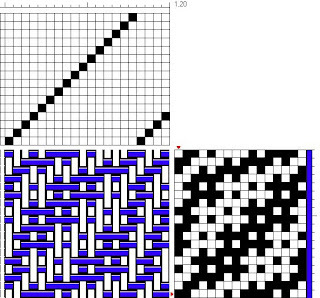 Over the years I have approached weaving from many different angles. Weaving for someone else to earn my bread and roof. Teaching. Writing articles for magazines. Publishing my own books. Encouraging weavers to learn more, become proficient at their craft, become confident enough to make their own choices, giving them information I believe they need to have in order to make good choices. I want to be part of the weaving community, but also encourage them to explore beyond their limitations, expand their horizons. Entice them into becoming outliers, perhaps? Community is important to all human beings. We share the human experience, but that experience does not have to be limiting. It can also be full of exploration and wonder. 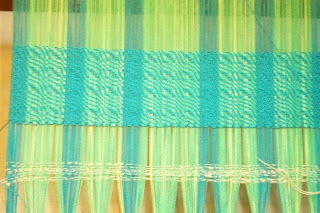 Next warp - going onto the AVL, a mixed blend of greens into the blue end of the spectrum with a little yellow for accent. Weft is hand dyed 2/20 unmercerized cotton I bought at NEWS. Each ball seems to be a slightly different colour so will sort them into the most similar colour 'lots', use each ball up in it's entirety and then move on to the next without paying too much attention to when and where the colour changes happen. I'm weaving the cloth as 'yardage' which I will then cut to length for towels. People will either like them or not. If not they will get used as hostess gifts. Buying this yarn was an impulse purchase, partly because I rarely see unmercerized 2/20 cotton, partly because hand dyed cotton this fine is quite rare. 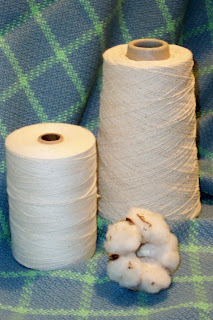 But it should make lovely towel fabric and I'm going to enjoy weaving with it. So long as the balls don't get tangled and messy when I wind them onto bobbins. Since it is such fine yarn I will pop them into a tall plastic bucket and wind off the outside so that the ball doesn't collapse as it would if wound from the inside of the ball. They will need a little coddling, but I think the resulting cloth will be worth the effort. Doug pressed the scarves today. I think they are a 'winner'. 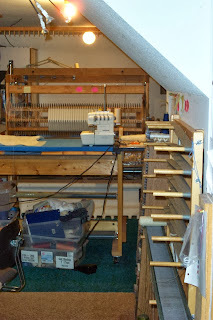 Now I have to decide if I wind longer warps and dress the big loom with them. 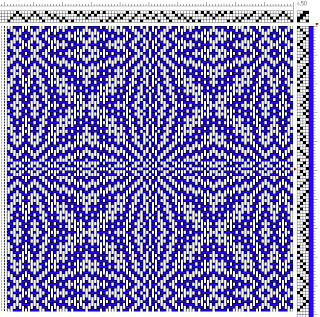 That would require a lot more fiddling, but make the weaving itself go more easily. I think you'll probably guess which route I'll take. If I'm going to weave these on the AVL, though, that means I have to weave the warp currently on it, off. Should not take too long as it is only 10 yards. In the meantime I can be winding warps and stockpiling them for when the loom is clear. 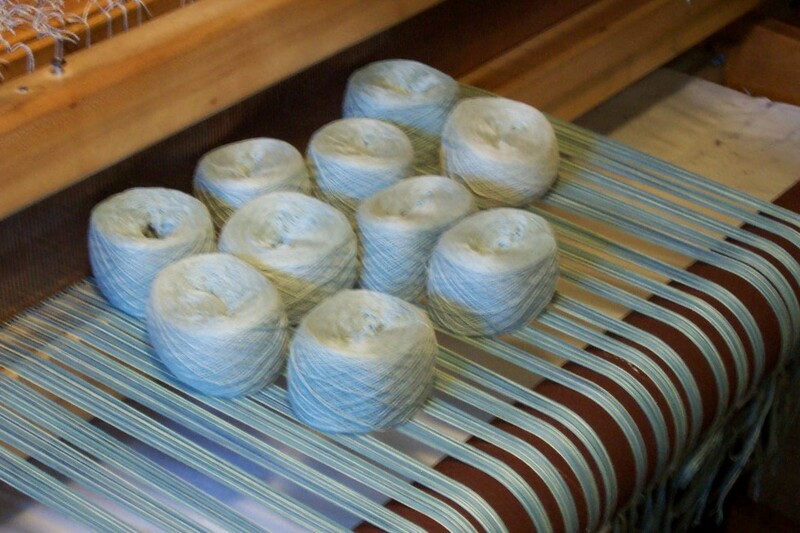 And use the small loom to weave more place mats. A friend needs to sell her 110 cm (43"?) Louet Spring Loom. 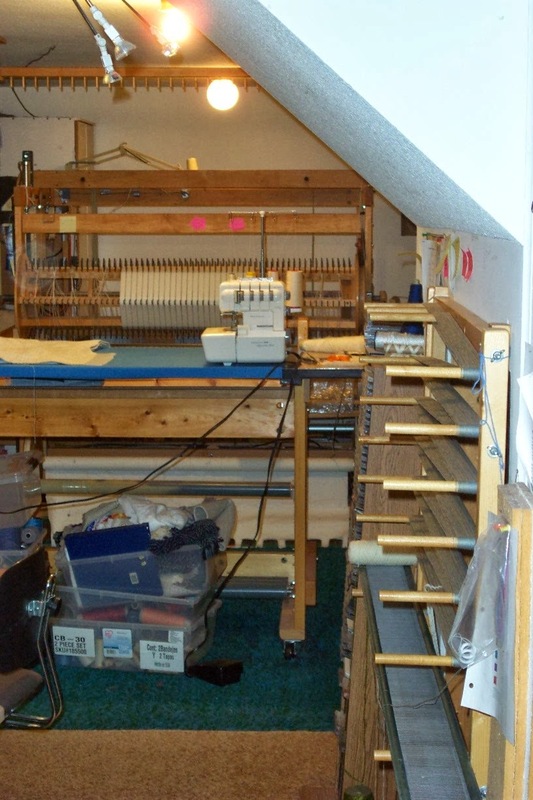 I'm not sure how many shafts it has or what accessories come with it but she needs to go into hospice so the loom needs to find a new home. Quickly. Two of my friends are currently in hospice. :( A good reason for having lots of friends younger than myself? Since I don't have any children, I guess my friends will have to help me downsize one day. 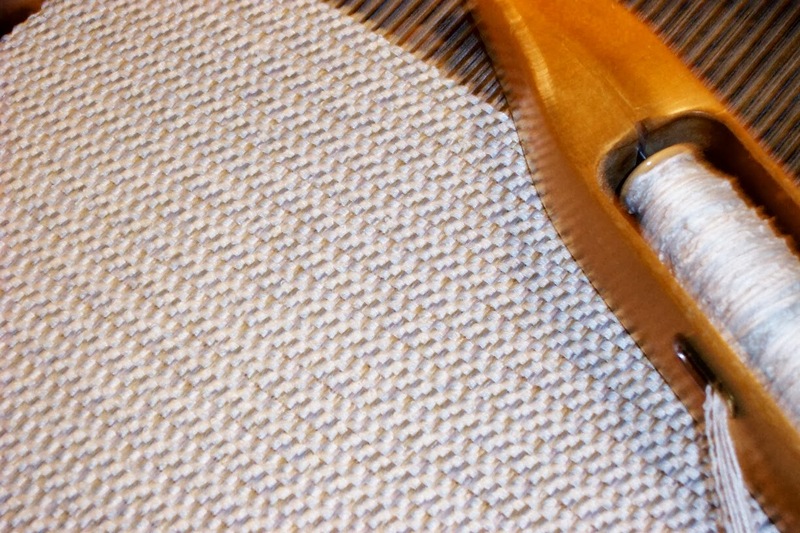 I am constantly seeing the advice on the chat groups that you must have a plain weave interlacement at the selvedge and if you don't as in the advancing twill above, you must use a floating selvedge in order to achieve good selvedges. Well, you can if you want to, but personally, I don't like weaving with floating selvedges. I learned how to weave without them, never saw the need for them (except in 3 or 4 very specialized instances) and never use them. 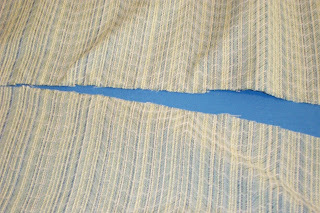 Some people need the security of using a floating selvedge. Some don't. My message, take it for what it's worth, is that you do not have to use them if you don't want to. Learn how to beam your warp with good consistent tension, then learn how to wind a bobbin with good tension and evenly wound - no hills or valleys - then learn how to hold and throw your shuttle so that the weft feeds off without snags and jerks. 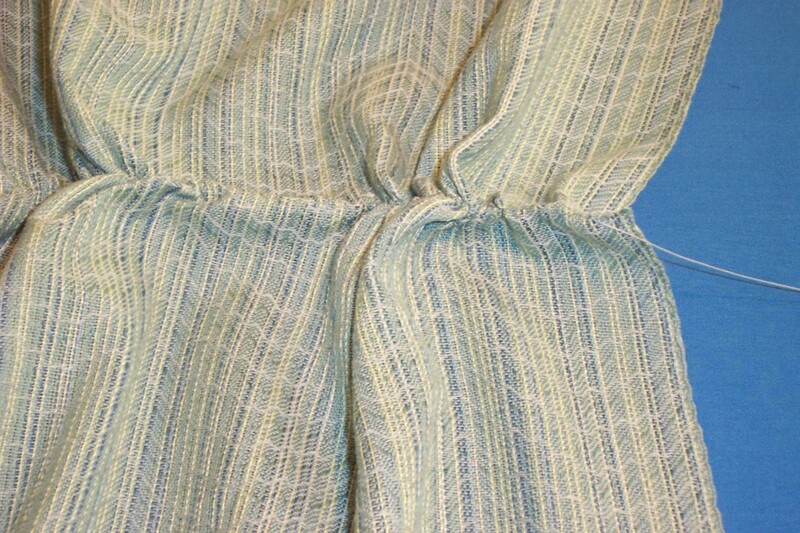 The above silk cloth (out of the washer/dryer but not yet pressed) was woven with an advancing twill treadling which means that there are no plain weave interlacements at the selvedge. Choose your expert, then decide for yourself what you need to do to achieve the quality of cloth you desire. See the 'mistake'? No I'm not going to go back and fix it. This is my proto-type. I don't expect it to be 'perfect'. I'm still getting the 20 pick treadling repeat set in my mind and feet and don't doubt there may be a few more 'oopsies' before I'm done. I will either keep it or give it away, but the primary purpose of this scarf is to work out the details. Once I'm satisfied I've got a good cloth, then I'll worry about 'perfect'.